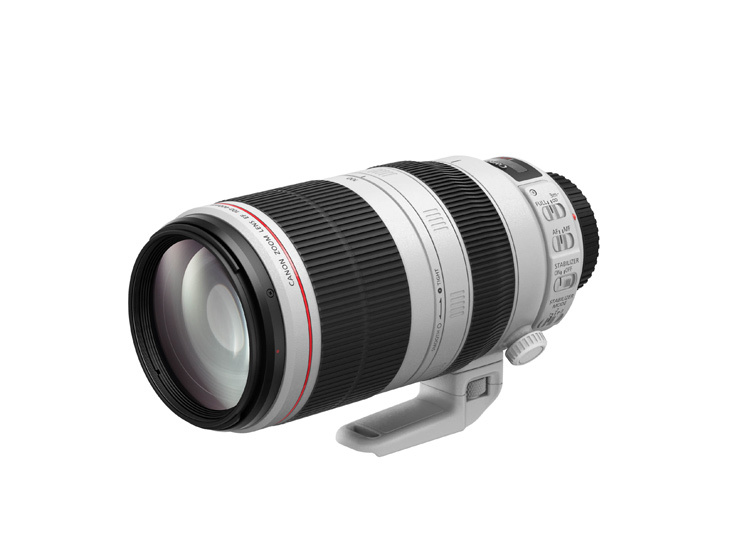 The new Canon EF 100-400mm f/4.5-5.6L IS II USM features a number of upgrades to improve both image quality and usability, including a built-in tripod collar and zoom lock. The new Canon EF 100-400 f/4.5-5.6L II USM is designed primarily for use on Canon full frame DSLRs, such as the EOS 6D or 5D Mark III, where it offers a versatile telephoto zoom range ideal for sports or wildlife photography. This latest lens is also compatible with Canon APS-C cameras, such as the 7D Mark II, on which it offers an even longer equivalent 160-640mm zoom range taking account of the Canon 1.6x crop factor. Sitting in Canon’s range of professional L series lenses, the new Canon EF 100-400 f/4.5-5.6L II USM offers a robust construction for professionals shooting in challenging weather conditions, as well as first class optical performance. The big development for this latest incarnation is that the new Canon EF 100-400 f/4.5-5.6 II USM now features a traditional twist action zoom, as opposed to the pull zoom of its predecessor. Canon says this is in response to photographer feedback, so it should be a popular change, but it has required an overhaul of the lens’s optical construction. The new arrangement utilises 21 elements with a combination of Fluorite and Super Ultra-low Dispersion (Super UD) lens elements as well as Canon’s new Air Sphere Coating (ASC) to help reduce ghosting and flare for improved image quality. The new twist zoom function utilizes a dedicated zoom touch adjustment ring with the ability to lock the zoom at any focal length and there’s now a built-in tripod collar. The collar enables easier rotation between shooting portrait and landscape with the lens mounted to a monopod or tripod, and the lens’s tripod foot can be removed from the collar to reduce the lenses size and weight when required. There’s also a redesigned lens hood for the new EF 100-400mm f/4.5-5.6L IS II USM, which features an access window for the rotation of polarizing filters without having to remove the hood. 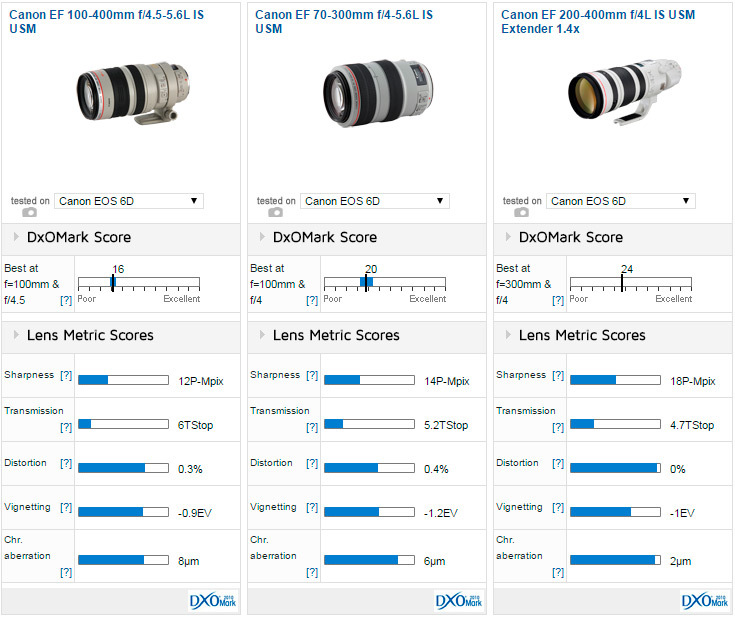 If we take a look back at the DxOMark lens metric scores for the original EF 100-400mm f/4.5-5.6L IS USM lens it’s apparent there’s some room for improvement that hopefully the latest version’s new optical arrangement can address. 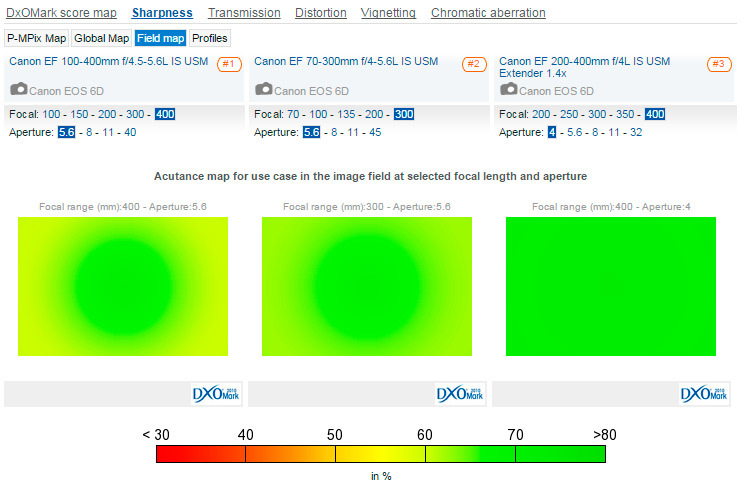 Tested on the full frame EOS 6D against other Canon L series telephoto zooms such as the EF 70-300mm f/4-5.6L IS USM and EF 200-400 f/4L IS USM we see the original 100-400mm lags behind for sharpness and overall. If you can live with a shorter 70-300mm focal range the EF 70-300mm f/4-5.6L IS USM lens is slightly cheaper with better results than the original EF 100-400mm f4.5-5.6L IS USM. Although offering slightly different focal ranges, the 100-400mm and 70-300mm Canon L series zooms are alternatives for sports and wildlife. Both offer similar features such as image stabilisation and USM autofocus motor and are in a similar price bracket, with the original 100-400mm available for around $1,700, or $1,450 for the 70-300mm alternative. If you can live without the extra reach at the long end of the zoom, the 70-300mm’s shorter focal length helps boost its optical performance, giving it a DxOMark Lens Metric Score of 20 compared to 16 for the original 100-400mm. For photographers needing the flexibility of a telephoto zoom up to 400mm and the very best image quality, the EF 200-400mm f/4L IS USM is the dream. Costing around $11,800 it’s well out of reach for most photographers but for sports and wildlife professionals demanding the best quality, its fixed f/4 maximum aperture and outstanding sharpness at all focal lengths is worth paying for. With homogenous sharpness across the frame at 400mm and a fixed f/4 aperture, the EF 200-400mm f/4L IS USM offers great results but comes with a hefty $11,800 price tag. There are however a couple of third party telephoto zooms from both Sigma and Tamron, which give the original EF 100-400 a run for its money. The $869 Sigma 150-500mm f/5-6.3 APO DG OS HSM and Tamron SP 150-600mm f/5-6.3 Vi DC USD are both cheaper alternatives, boasting similar features as well as extra reach at the long end of the zoom. 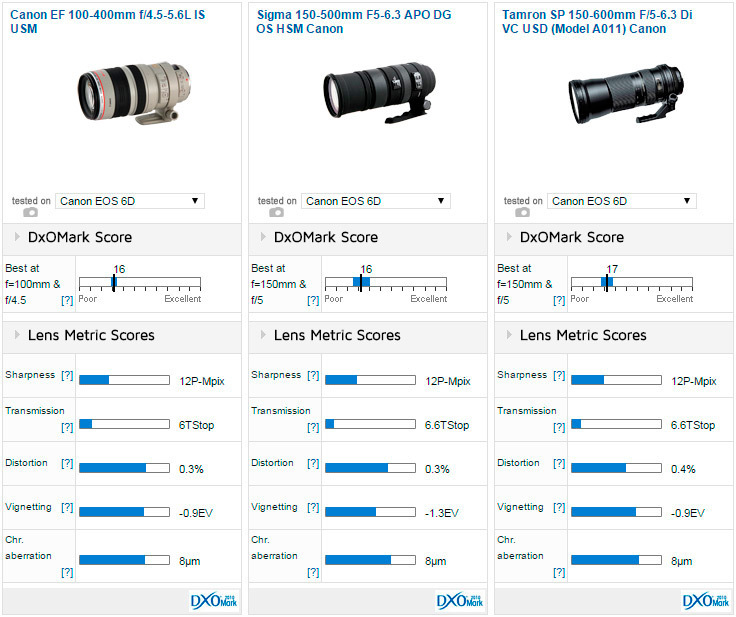 Tested on the EOS 6D all three lenses achieved similar DxOMark Lens Metric Scores, which is a great result for the third party options considering the extra focal length on offer. All three scored 12P-Mpix overall for sharpness but shooting at the lenses’ maximum aperture at 400mm the Tamron was clearly superior with better resolution in the corners of the frame compared to the other two. Click the links for a full review and analysis of both the Tamron SP 150 – 600mm f/5-6.3 Vi DC USD and Sigma 150-500mm f/5-6.3 APO DG OS HSM. 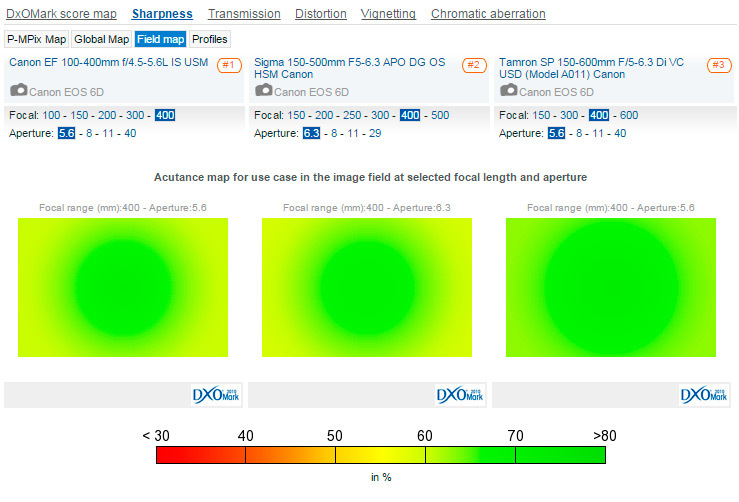 The cheaper third party telephoto zoom competition from Sigma and Tamron achieved very similar DxOMark Lens Metric Scores to the original EF 100-400mm f/4.5-5.6L IS USM. With these cheaper alternatives hot on the heels of the Canon L 100-400mm it’ll be interesting to see how the new optical arrangement on the updated EF 100-400mm f/4.5-5.6L IS USM performs when we get it in the lab. Look out for a full test and review soon. 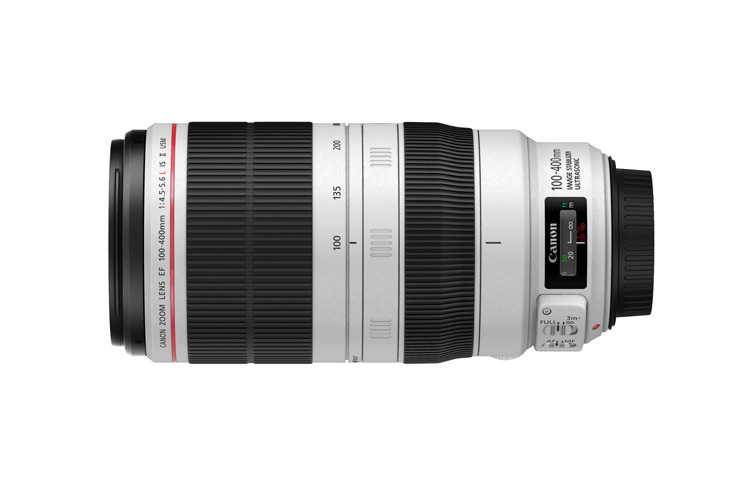 The new Canon EF 100-400mm f/4.5-5.6L IS II USM will be available from December 2014 priced around $2,000.